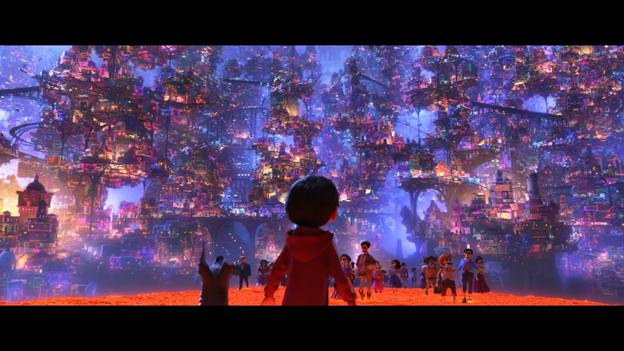 Some thoughts on Pixar's "Coco" - originally posted over on my blog on Medium. Old town. Favela. Souk. Slum. Ghetto. Historic district. Shanty Town. Handmade architecture. Organic urbanism. As long as humans have organized themselves into a coherent society, they have constructed habitats. These have been largely built by hand. Even today, steel beams are guided into place by gloved workers, assisted by machines and logistics. Yet the most compelling of human habitats are agglomerations, where master plans are often overwhelmed or superseded by a grassroots assembly that meets basic needs first, expresses an innate creativity second, and leaves a legacy, third. Works of singular architecture may tweak these priorities, but the most compelling urban environments are often those built by a community or their forebears, arranged according to functional needs, and expressing some essential values of that community. When gentrification wrecks a historic neighborhood and displaces a community, it is a tragedy; but grassroots urbanism continuously reconstitutes the idealized human-scale, community-built urban form — somewhere, sometime — and these ad-hoc constructions form the bones of future cities, frameworks for an urban culture that values connection over commerce. A perceptive observer might imagine the high-rise district that will inevitably rise over Mumbai’s Dharavi slum (tour guides are ready on the front lines), or the cities that may emerge from Lebanon’s Syrian refugee camps. Despite the churn of gentrification, traditional human-scale urbanism is not on the decline: the march of modernity threatens established neighborhoods and cities, but the human impulse to create, to build, to make and construct sites of commune remains undiminished. The field of action may be displaced, but society still lays foundations, establishes communities. And while development and gentrification, wholesale demolition, natural disasters, and climate change all threaten traditional settlement patterns and historic districts, the new cities and zones built on their ruins are constrained by the palimpsest of the past. The temporal continuity of urban morphology is one of human civilization’s through-lines: a time-traveler from the present dropped in Rome or Beijing 2000 years ago might recognize the street grid, if not the buildings. Jumping forward in time, I might find my favorite Seattle neighborhoods entirely rebuilt, but the major streets would remain. Uncovering the layers of history is one of the main pleasures of travel, and of urban research. The thought of padding on cobblestones trod by Jesus or Shakespeare, the contemplation of former lives and glories, that perceived connection to a venerated past, the self-aggrandizing notion that you (yes, you!) are an architect of the great project of human civilization: these are the joys of the urban experience. On the surface, this is a story with a simple message about family, grief, and the human experience. A boy feels estranged from his family: an outsider. He rebels, is cast out, completes a classic hero’s journey, then returns to forge an emotional connection with his dying grandmother, and reconciliation ensues. The boy returns to the fold as the family admits the error of their ways, and the grandmother, nearly forgotten in her own lifetime, is given a new vitality by her connection with the new generation. 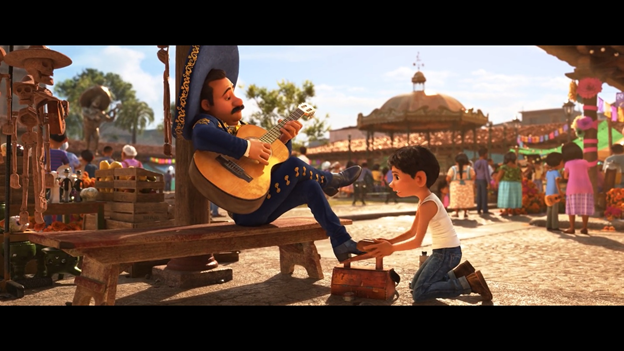 Through the process, the boy, Miguel, realizes that what he thought were his unique skills and interests were, in part, inherited traits: by the end of the film the has gained newfound respect for his heritage, and his family has expanded their narrow conception of their capabilities and place in the world. Like the colored cut paper flags that daisy-chain across the opening and closing credits, a family is a series of connected lives, scenes, vignettes: each is unique but related; each relies on the one before, and the one ahead. Like cinema: these linked scenes, taken together, tell the story as a whole; none are complete without the others. 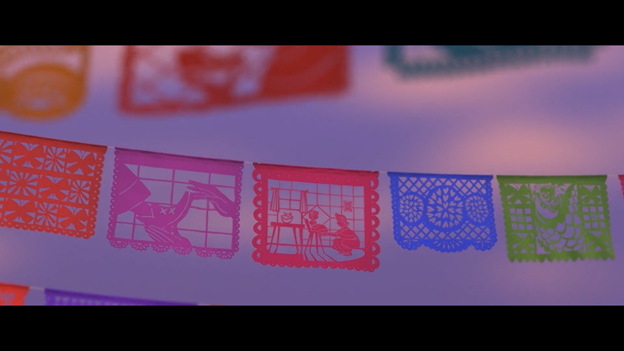 This generational continuity is “Coco”’s cornerstone: the film’s foundation. 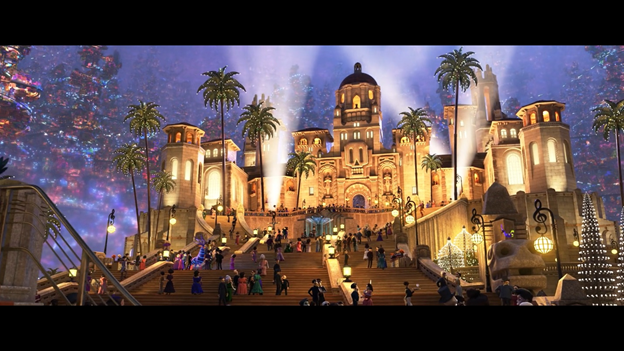 The architecture and urbanism of the film’s Land of the Dead reinforces this theme with every Mayan block, wrought-iron rail, aerial tram, and construction crane. The film begins in a dusty cobblestone town, where Miguel lives with his extended family around a courtyard: all adobe, wood, and red tile roofs. The town square features a wrought-iron gazebo; the cemetery is filled with elaborate stone tombs. These stylistic touchpoints are all brought into the Land of the Dead, amplified. The initial passage is via a bridge constructed of marigold petals, from which vantage we are amazed by the megastructure beyond: piles on piles of houses, fogging in the distance like Chinese landscape paintings; an ad-hoc agglomeration. 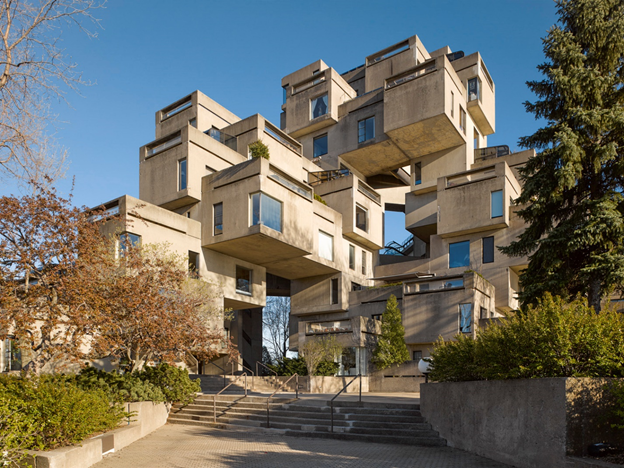 The structures recall Safdie’s Habitat ’67 gone exponential and technicolor, a Metabolist fever dream, or a pixelated nebula. But look closer, and we see the lowest level of this world is populated by Aztec pyramids; above those, a layer of Spanish-colonial, above that Victorian, Nouveau, Deco, Modernism, and at the very top, a poke of cranes, anticipating the next arrivals. 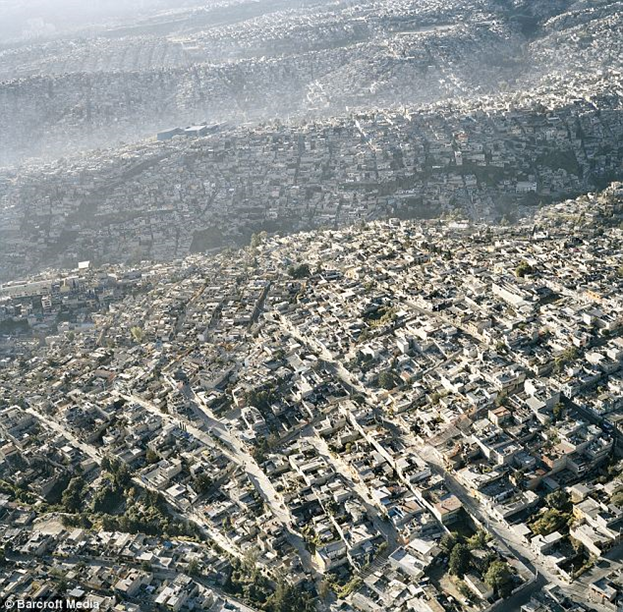 This city, a 3D urbanist fantasy, is temporally layered, each new age built literally on the roof of the last. 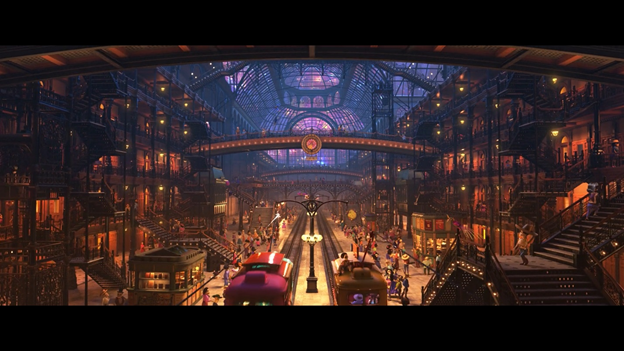 The production designers are explicit on this point, and so the set reinforces the film’s major theme. 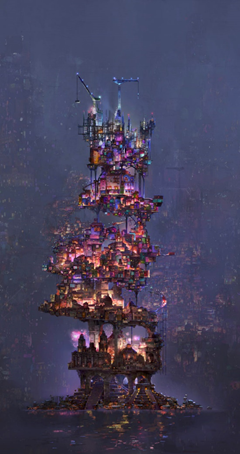 The Land of the Dead is a fractal, anti-gravity Tower of Babel, whose temporal stylistic sequence maps to a vertical trajectory. This physical accumulation of history makes for stunning visuals, especially as we follow our protagonist on an aerial tram line through the carved void of this world. The street scenes convince us that this is a living world, despite the name, and every scene reinforces the idea that this is an organic, lived-in community, built with hearts and hands. The exceptions prove the rule. 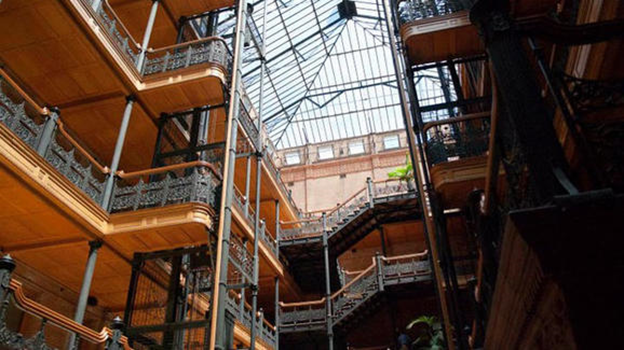 The pyramid foundations are seen in passing only, but the Mayan-or-Frank Lloyd Wright blocks of the border crossing evince some degree of central planning, and the Bradbury Building — Crystal Palace hybrid that serves as the main train station is revealed as a bastion of bureaucracy. 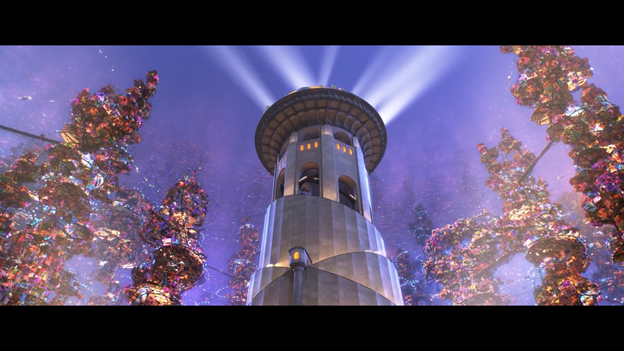 The climax of the film takes place in a stripped-down modernist tower capped with a Mission style mansion, then proceeds to a modern stadium (with some pyramid stairs for authenticity). Where the vertical striation of this urban fantasia reinforces the overall theme, the sites of narrative conflict challenge it: the tower is an anomaly, a greyscale monolith in a cloud of fireworks. Out of continuity, out of time, its architect is eventually revealed as a thief and charlatan, whose reputation collapses following the revelation that he had murdered his songwriting partner who chose family over fame. 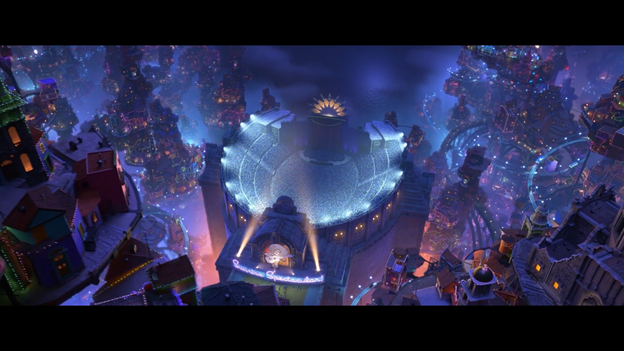 In the film’s conclusion, the true songwriter of “Remember Me” has his reputation restored, and is welcomed back into the family, while the murderous interloper is, ironically, forgotten. The film portrays the Land of the Dead as a largely conflict-free, politically-neutral zone: no commentary on Spanish colonialism, indigenous genocide, or of the environmental consequences of a metastasizing urbanism. Yet the visuals betray a darkness in this world of perpetual twilight. 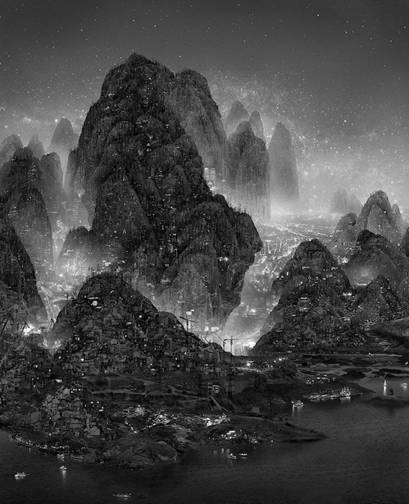 The agglomeration of the Land of the Dead recalls the rolling hills of outer Mexico City, carpeted with dense endless clusters of structures; or the encrustation of buildings that line the rim of Santorini’s crater; or the 3D urbanism of Chengdu, translated into fantasy in the work of digital artist Yang Yongliang. 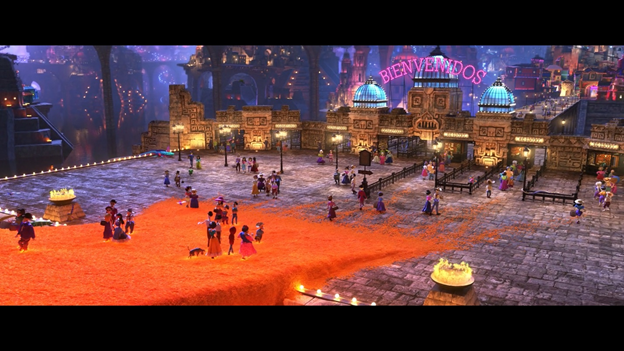 The world of Coco is largely lacking flora or fauna; even the animals are urban subjects. The exultation of human connection and continuity seems to have come at the expense of nature. 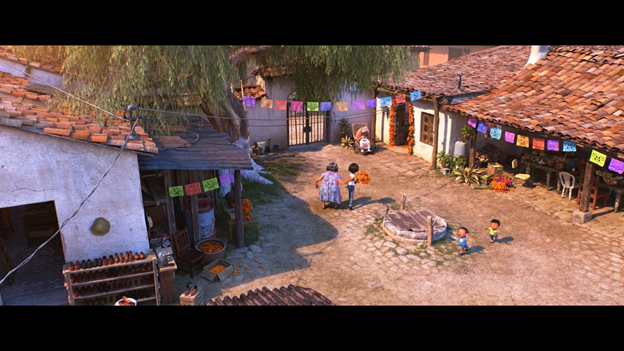 I’ll leave the “Pixar Theory” threads dangling for another day, but I’m intrigued by the idea that a film with such a deeply humanist heart has allowed such rampant development in its world, whose citizens’ encounters with the natural environment are limited to paths strewn with marigold petals. 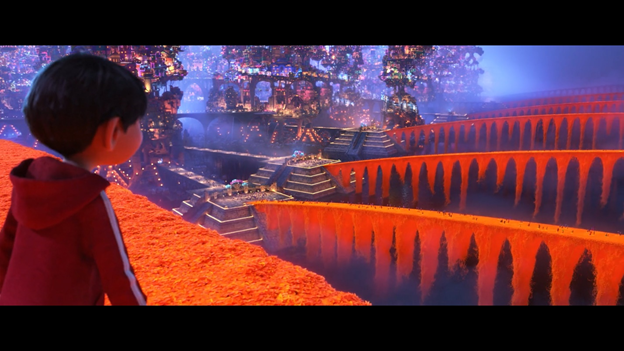 Coco’s civilizational logic is one of continuous, unchecked growth in an infinite space of potential. There are no apparent limits to the Land of the Dead, no resources beyond what the living place on their altars on Dia de los Muertos and the abstract currency of memory. Economic disparity certainly exists, but with few tangible consequences beyond “real death” — which is positioned in the narrative as not quite inevitable. If immortality is achieved through remembrance, then the incentives for pursuing celebrity or authority must be huge in this world, but these themes are left mostly unexplored, and the ties of family are taken as superior to the ties of association or fandom, as a given, with no explanation. 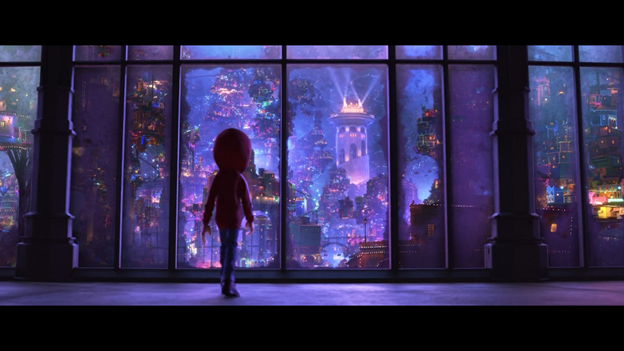 In the world of Coco, family connections trump all other associations. The veneration of the past is paramount. Incremental social change is accepted only grudgingly. Natural ecosystems have seemingly vanished in the face of urban development. This all feels shockingly familiar in our world, the real world, where revanchist nationalism is on the rise globally, where tribalism and isolationism strengthen family bonds at the denigration of “the other,” and environmental collapse seems a foregone conclusion barring unlikely coordinated global action. 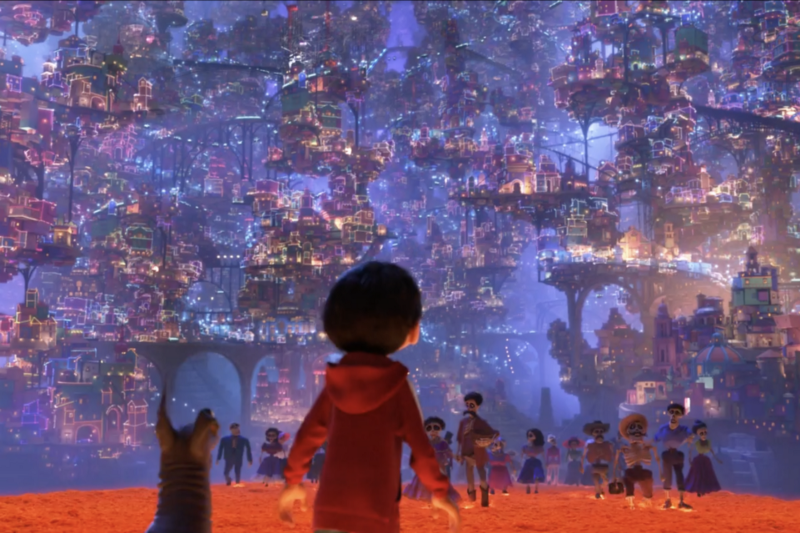 Yet in the face of these converging catastrophes of the Anthropocene, “Coco” offers some hope: that our civilization is built on relationships, that human society is guided by shared history and cultural consensus, and that the music, art, structures, stories — and shoes! — that we collectively bring into being are ultimately worth the effort; our memories are worth preserving; our cities are worth maintaining; our civilization still has the capacity for gradual improvement, sustainability, and continuity. Synthetic St. & Burlap Blvd.